Plain sophistication rests at the helm of this latest Swiss-made timepiece from Bernhard H. Mayer®, bearing the mark of the modern man. Stark black from its polished stainless steel case to its genuine leather straps, its boldness is further enhanced by its striking red and white dial and the white stitching lining the leather. Made for the man for all seasons, ensuring that you’ll face every challenge in full confidence and style. 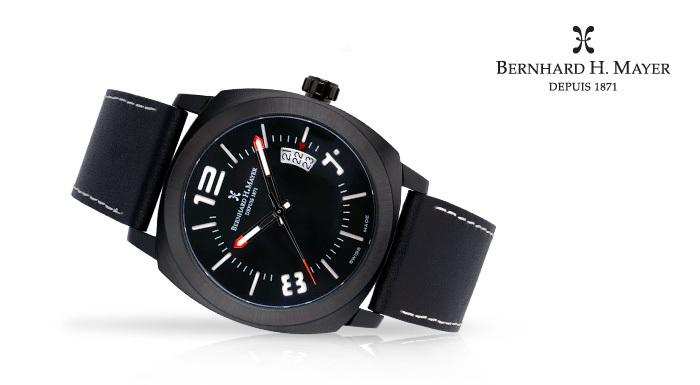 Dare to be bold and display your true strength with Bernhard H. Mayer® IL Nero.